Please find below an overview of all Cambridge English exams. For detailed information about the according exam please click on the exam level of your choice. 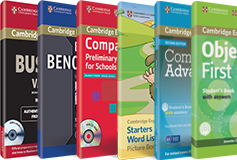 These sample tests will allow you to see what a full computer-based or paper-based Cambridge English exam will be like, and shows the types of questions that will appear in the live exam. Please note that with these sample tests, no results will be issued.